We serve the needs of professional money managers and other fiduciaries who need expert diligence and analysis on CEOs and senior executives that run public firms. We use a structured methodology to evaluate the relative quality and skill of managers, helping equity and debt investors to determine the relative risk and operating ability associated with those executives. We work solely for our clients and have no brokerage, investment banking, or corporate finance conflicts. Our services are provided on an annual retainer basis and our clients number among the largest and most successful professional investors in the world. Clients can utilize our expertise for special diligence projects, data analysis and comparative studies of senior managers across industry and geographic regions. Our management profiles are renowned for their concise coverage of the key facts and figures investors need to know. Our Management Quality Ranking system is statistically significant in forecasting relative total returns and subsequent operating results across the Russell 3000 population of investable companies. Management CV is a pioneer in applying statistical science to evaluating the skill and quality of management. Our methodology blends the historical facts of an executive’s track record with a qualitative assessment of forward-looking variables of interest to investors and lenders. Our Analysts work from structured due diligence templates to insure that they cover key issues of track records, compensation, and fiduciary risks consistently and reliably. 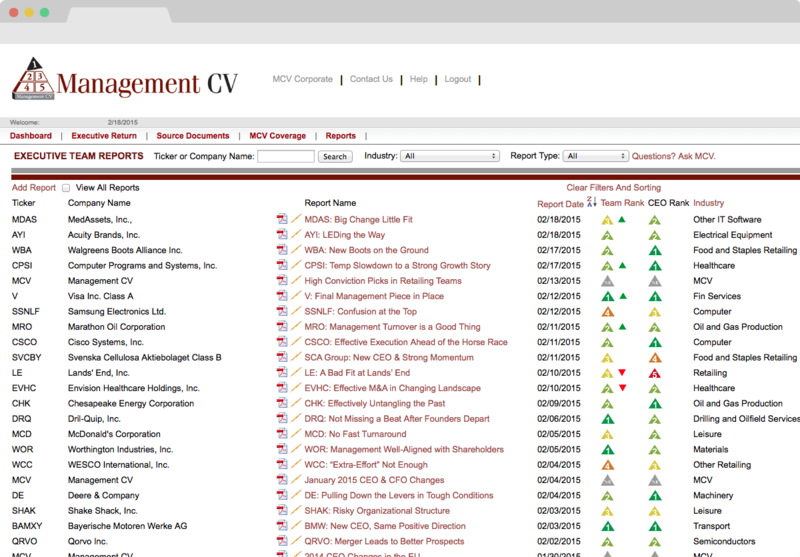 Fiduciaries in the investment, lending, and insurance markets can rely upon Management CV’s system to insure that they are properly, and factually, aware of the background and incentive alignments of the management teams in their portfolios. Our team lets you leverage your time efficiently and focus on what you need to know about facts that correlate to performance. Summary - Appointment of Stephen Scherr as CFO most recent in Goldman management changes. Does GE Finally Have the Right CEO? Summary - General Electric (GE)—and its investors—has been let down by its chief executives. Can John Flannery finally do right by the company, which was booted from the Dow Jones Industrial Average earlier this month? Summary - Automatic Data Processing Inc.'s finance chief plans to resign from his post. Jan Siegmund will remain in the role while ADP looks for a replacement, Chief Executive Carlos Rodriguez said during a meeting with investors Tuesday. Summary - New Papa John’s International CFO Joe Smith had been with the company for 18 years when he was tapped last month to lead finance. So, he presumably knew what he was getting into. Yet he’s got an essentially “impossible” task in front of him, according to Management CV. Summary - CSX Corp. hired the renowned railroad turnaround artist Hunter Harrison in March with much fanfare and investor support, despite concerns about his undisclosed illness. Now, that decision has backfired, leaving one of the biggest U.S. railways with a depleted leadership team in the midst of a restructuring. Summary - After years of losses, a hedge fund iconoclast ponders his future. Management CV CEO Renny Ponvert comments. Summary - In rebutting Bill Ackman's call for a new CEO of ADP, Management CV suggests the problem is in the finance chief's office. .
Summary - Investors might want to consider why top executives are at odds with their companies’ share-repurchase programs . 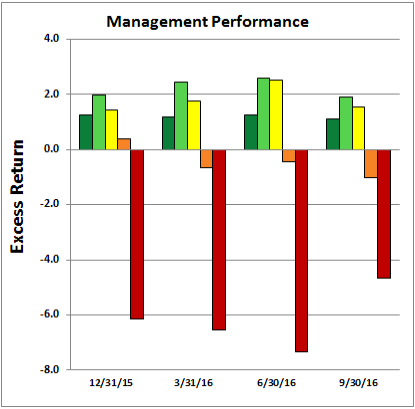 Summary - Management CV gauges financial and management performance to anticipate which companies might cut their dividends. 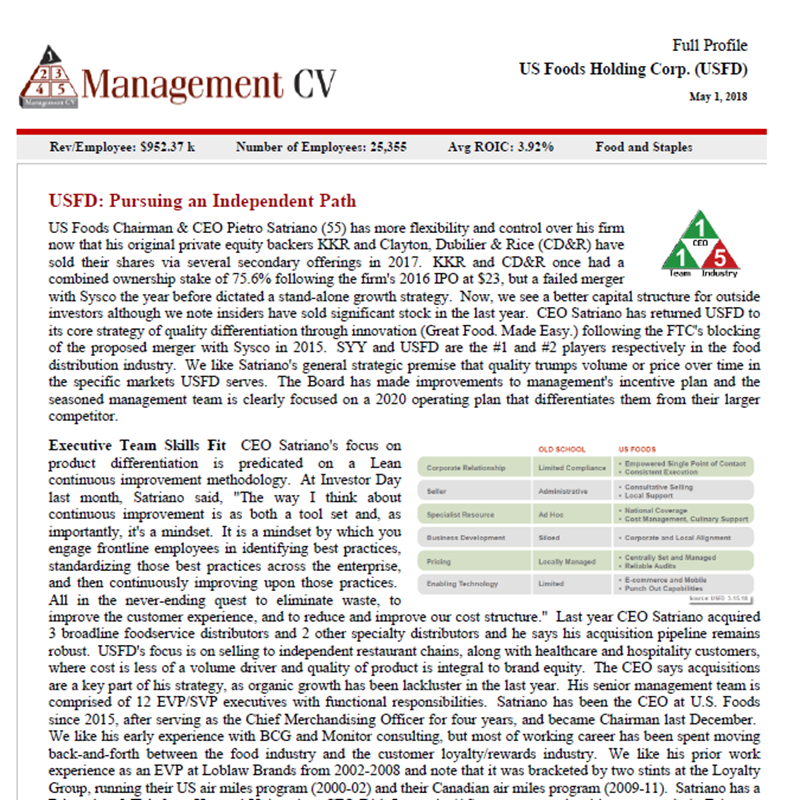 Summary - Management CV compiled a list of 29 "precarious dividend payers" in the S&P 1500. You might be surprised by some of the names that made the cut. Summary - When investors evaluate a company, quantitative measures, like profit growth or how one dividend compares to another, typically come to mind. But a qualitative intangible, such as how good a company's management is, is harder to assess. Summary - The vast majority of shareholders of CSX on supported an unusual and controversial one-time $84 million payment related to the recent appointement of of the railroad giant's chief executive, Hunter Harrison. Management CV suggested that CSX has set itself up for future disappointment with Harrison as CEO. Summary - The pay package of Ralph Lauren's (RL) new CEO is "extravagant," Management CV says. The research firm estimates Patrice Louvet, who will join Ralph Lauren as CEO in July from Procter & Gamble (PG), has a total pay package worth $25M. Summary - Companies that hired a CFO with experience in the same industry outperformed a broad index of U.S. companies by an average 2.3 percentage points in shareholder returns during the year ended June 30, according to Management CV Inc.
Summary - Last week's split of Hewlett Packard into two separate but essentially equally sized firms (HPQ & HPE) is all good for long term investors but HP, Inc is the better entity for long term shareholders. Summary - Patricia Little's lack of food-industry and M&A experience could bite the company, says Management CV. Summary - We are in the midst of the annual proxy season for U.S. companies and it is a time that juxtaposes huge CEO compensation plans with sub-par operating performance. Exceptions often prove rules and we identify four CEOs and their management teams that have delivered on key elements of superior and sustainable management quality: track record, compensation alignment, capital allocation, and personal stock ownership in their firms. "It's a dominant practice," said Renny Ponvert, chief executive and director of research at Management CV, which provides research on corporate executives. The high-profile outside hire plays well in the media and gives shares a boost, but the effect is fleeting. Americans love stars. Celebrities, athletes, politicians and, yes, corporate executives. Nearly 20% of the 3,000 largest publicly traded companies in the U.S. change their CEO or CFO in a typical year, and the chance to put a big name in the C-suite is alluring to corporate boards, says Renny Ponvert, the founder and chief executive of Management CV, a firm that analyzes management teams and executive changes for a client base of institutional investors. One of the biggest mistakes boards can make is reaching outside company ranks for a big-name executive who turns out to be a poor fit. Use our contact form for a personalized consultation. are required fields. © Copyright 2017. Management CV, Inc. All rights reserved.